We asked, and all of you answered! Some of you may recall a little Instagram poll we ran a few weeks ago with a slew of random questions regarding your preferences surrounding wedding-day stationery. We were genuinely curious to hear all of your opinions on the subject! You see, for folks like us in the wedding industry, every detail counts - from the clip in the bride's hair, to the greenery gracing the place setting, and of course, even down to the invitation suite, stamps, and the styling ribbon and fabric that goes with them! But we also completely realize that there may be a stigma of sorts surrounding the fact that us designers may also have a tendency to lose sight of things the average person may consider, such as budgetary restrictions and practicality, all in the name of making everything look good. Well, what if we told you that our main goal is always, always a combination of BOTH!? As experts on sourcing and curating customized design elements, of course we are consistently on the hunt for what's going to make your day equally unique and beautiful, but as masters of managing budgets, we also fully appreciate and understand a desire to pare down, refocus, and consider what elements are truly important to achieving your vision. 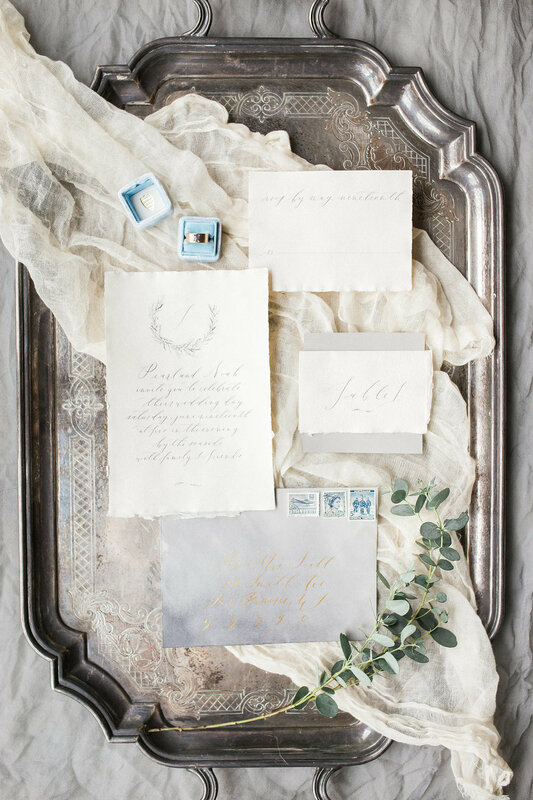 Try as we may, however, and much like flowers, we will always hold a special place in our hearts for stunning stationery and day-of wedding goods, and wanted to share with you all today your responses to our poll as well as a few of our favorite stationery images over the years! 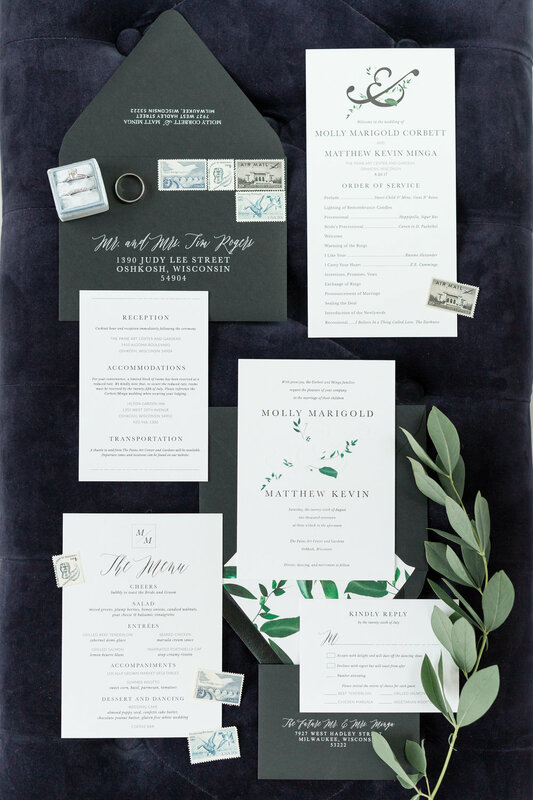 Q: Did you or will you order your stationery through a custom designer or online? Q: Do you prefer a clean digitized font in an invitation suite or a more classic calligraphy look? Q: Let's talk day-of stuff - Table Numbers, Menus, Programs, and Place Cards: Are you into them? Q: On a similar note, let's get into the "designer" part of your brain: how do you feel about the overall shot of an invitation suite? A: 90% love // 10 % what's a suite? 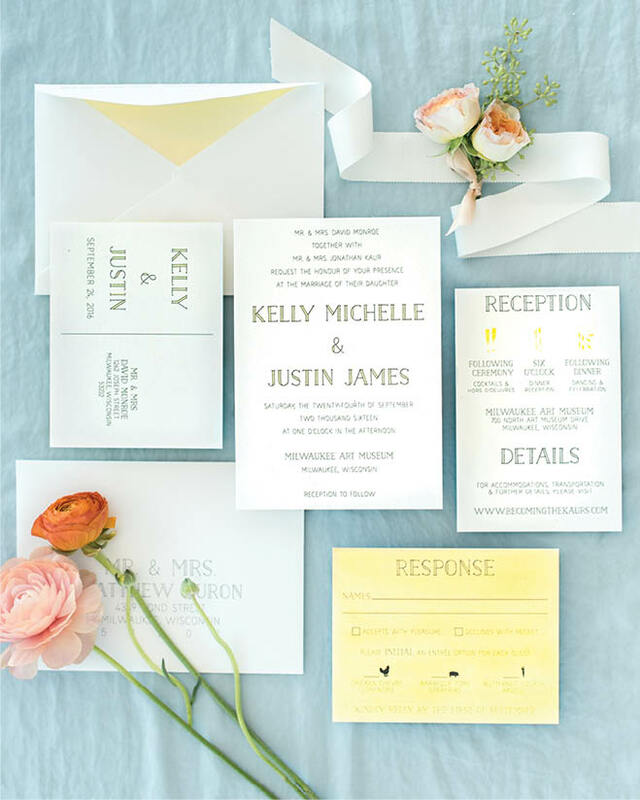 Q: When it comes to the overall look of wedding-day paper goods, what are you more attracted to? Q: How do you plan to ask your guests to submit their RSVP to the wedding? Q: Overall, is a unified invitation suite important enough to you to include as a line item in your wedding budget? If you're still reading and want to know more about those really helpful tips we mentioned, well, we'll cut the suspense! 1. If you or anyone you know are still struggling with the words "custom stationery" and the fact that they immediately bring to mind LOTS of dollar $ign$, you’re not alone! It’s a common misconception that the moment you see ‘custom’ describing any product or service you can automatically plan on spending double what you would at a big box retailer. Well, our amazing gal pals at Mint & Lovely recently shared a SUPER helpful blog post detailing ALL of the cost breakdowns associated with using a custom designer vs. an online retailer, and the results may surprise you! Click here to read more! 2. We aren't completely ruling out the fact that custom stationery still isn't for everyone. Even if you are steadfast on ordering online, you should still touch base with your wedding planner - lots of times, we have access to insider deals and exclusives that are only available to us and our clients! Interested? Just ask!